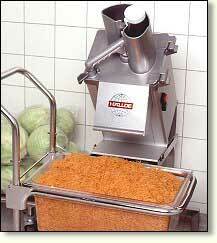 Tabletop model of the Industrial Food Processor with a capacity of up to 1000 lbs/hr. The forward leaning design puts the feed head and pusher handle close to the operator. The feed head can be set open for loading using both hands. This design makes it easy to work the machine at full capacity for long periods without operator fatigue. When the feeder is opened the machine stops. Close the feeder and the machine re-starts automatically. Replacement Blades Available.